Although accounting standards encourage the direct approach, most companies actually present an indirect statement of cash flows. The indirect approach is so named because the “reconciliation” replaces the direct presentation of the operating cash flows. Except for the shaded areas, this statement is identical to the direct approach. The first shaded area reflects the substitution of the operating cash flow calculations. The second shaded area reflects that the indirect approach must be supplemented with information about cash paid for interest and taxes. Understand the difference between the direct and indirect approaches to presenting the statement of cash flows. How are noncash expenses dealt with in the preparation of a statement of cash flows prepared under the indirect approach? How are gains and losses dealt with in the preparation of a statement of cash flows prepared under the indirect approach? 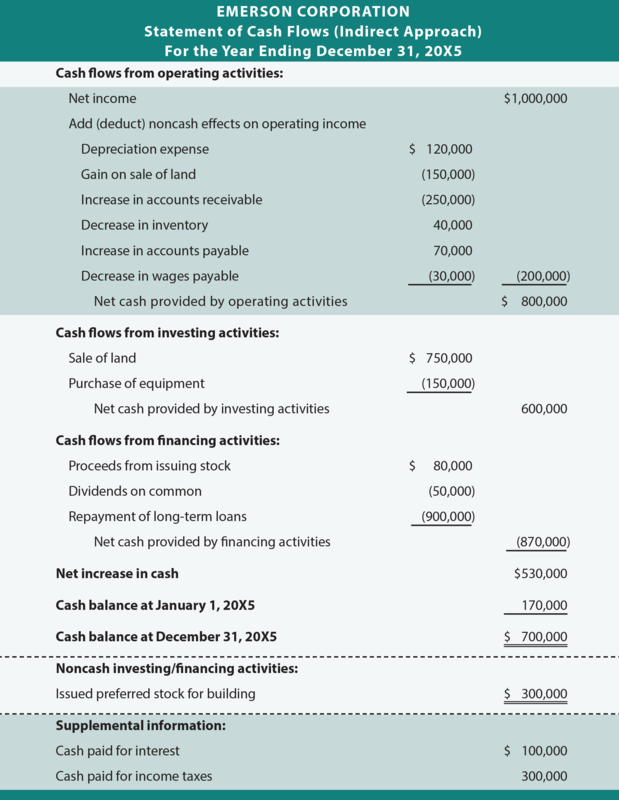 Know how to prepare a statement of cash flows under the indirect approach.